All relay team members will have access to the Transition area. Bikes must be in the transition area by the time transition area access closes at 7:45am. Relay teams must pass the timing chip to their teammates at your bike rack spot in the transition area. For safety reasons during the race, you are not permitted to ride your bike into or out of the Transition area. You must walk or run your bike while on the grass areas of the Transition area. There will be clearly marked mount and dismount lines once out of transition. Please watch out for other athletes as you move through the Transition area and follow the instructions of race officials and volunteers. The official swim cap found in your race packet MUST be worn during the entire swim. Do NOT trade your swim cap with another athlete as the caps are coded for your race category, as to assist race management in organizing you at the swim start. If you have a latex allergy, you may bring a non-latex swim cap and you should alert a USAT official that you will be wearing one. If possible, wear the one we give you over your non-latex cap. The use of wetsuits during the swim segment will be allowed, and is encouraged, if the water temperature on race morning is 78.0 degrees or less. If the water temperature exceeds 78.0 degrees but is less than 84.0 degrees, an athlete may wear a wetsuit but will be ineligible for awards and national ranking consideration. If the water temperature is 84.0 degrees or higher, the use of wetsuits is strictly prohibited. Based on water temperatures in late June the last few years, water temperature can be anywhere from the low to high 70s. 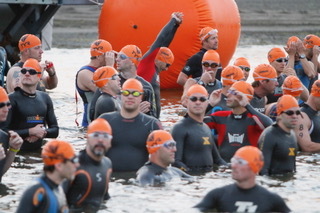 The swim start is an in-water start from the Swim Entry spot located very near Transition area. Athletes will be called into the water by wave. There will likely be warm-up swimming allowed until 7:10am. At that time, all athletes MUST be out of the water. The start line will be between the beach at the Swim Entry and a buoy directly out towards the opposite side of the lake. You will be staged according to swim cap number. Failure to wear the official swim cap or starting in a swim wave other than the one in which you have been assigned will result in your disqualification. Seed yourself in your wave according to your ability. If during the swim segment, you cannot continue, remove and wave your cap and a boat will pick you up or you may swim to shore. Be sure that you notify a race official at the Finish Line Area. If you drop out of the swim, you cannot continue with bike or run segments due to medical concerns. The swim course is a rectangular-like loop with a separate Swim exit that is very near the Swim entry. From the start, you will swim straight out and when you reach the buoy by the bridge, you MUST swim around the buoy to the the left. Failure to do so will result in disqualification. After swimming by the bridge, you will continue straight for 3 more buoys. At the 4th buoy, you will need to swim around it, counter clockwise and swim back to the beach exit point. For your safety, Buffalo Underwater Recovery Team, and other certified water safety personnel will be monitoring the swim course with rescue craft. We've tested Darien Lakes State Park water and it is safe and clean - it is cleaner than many bodies of water that are used for area triathlons. We look forward to a crystal clear swim. The bike course is a double loop course. You must complete the loop twice. When you complete your FIRST LOOP, stay to the RIGHT to begin your second loop. When completing your SECOND LOOP, stay to the LEFT to enter transition. Each athlete is required to wear an approved helmet during the bike segment. You MUST have your helmet securely fastened on your head before you mount and dismount your bike. A USAT rule requires you to wear your helmet at ALL times when on your bike at an event, including before or after the race - you MUST wear your helmet and if spotted riding without your helmet you will disqualified. Drafting and blocking (impeding the progress of passing cyclists) are not permitted during the race. USAT officials will be monitoring the bike course and strictly enforcing these rules. Failure to obey the instructions of any USAT official may result in your disqualification or a time penalty. The USAT Head Official will explain key rules at the pre-race meetings on Saturday. Upon completion of the bike segment you must re-rack your bike in your space. Failure to do so will result in a disqualification. There is no water bottle exchange on the bike course so please make sure you have enough liquid with you on your bike when you start the bike portion of the race. There are weight graded categories dictated by USAT. To be classified as a Clydesdale you must be a male weighing 220 lbs or over. For the Athena category you must weigh 165 lbs or over to be classified as such. The run course is a shaded route that will take you through the Darien Lakes State Park trails. The course is well marked, follow the signs and volunteers. There is a water station at the roughly 1 and 2 mile marks. There is NO pacing of runners allowed by any outside source. Runners observed with a pacer/non-entrant will be disqualified. USAT officials will be recording race numbers to ensure each athlete completes the prescribed course. There will be a lead cyclist on the run. The finish line will be close to transition. Please make sure you remove your timing chip from you ankle and return to the volunteer after you cross the finish line. Fruit, yogurt, and water will be at the finish line to help replenish yourself quickly. The post-race celebration begins as soon as you cross the finish line! Be sure to stick around for food, massage and refreshments. Athletes can get food with their wristband. Food will be provided by Cappelli's Pizzeria. Included will be hot chicken, pasta salad, and pizza. Score-This will be handling the official timing. You MUST use the chip they provide you. You may NOT use your own chip. Unofficial race results will be posted prior to the awards presentation. Please report any discrepancy to a USAT official PRIOR to the start of the awards presentation. Athletes who do not wear their chip during the entire event will not be scored and will not receive a finish time. Please note that the clock time at the finish line reflects the race start time of the first swim wave. Full results and splits will be available on our web site at www.eclipsemultisport.com within 24 hours after the race. If you qualify for an award and are unable to attend the awards presentation, please send us your name, age group and a check in the amount of $10.00, made payable to Eclipse Multi-Sport, LLC, 5859 Woodlee Court Orchard Park, NY 14127 and we'll first class mail your award to you. If you drop out of the race, it is IMPERATIVE that you notify a race official and return your timing chip at the finish line. All protests of penalties assessed for rules infractions by USAT officials must be filed with the USAT Head Official within 60 minutes after the protesting individual finishes. Judgment calls (e.g., drafting) are not eligible for protest. Genessee County EMS will provide comprehensive medical care for all official participants during the event. The medical team is prepared to treat for dehydration, minor injuries and road rash and will assist emergency medical services in transporting athletes with any major injuries to the nearest hospital. Unsportsmanlike conduct or the verbal abuse of any race official or volunteer during any portion of the race or at any time during event weekend will not be tolerated and will result in immediate disqualification. The course is nice for spectators with the 2 loop bike. We suggest the ideal spectator location to be: Transition Area and Finish Line with parking on Thorn Avenue. We're excited for the 8th year of the SteelKids Triathlon on Saturday. The Kids Race has three components as well as the adult race. Bert's Bikes and Sports will be on site for day of adjustments and repairs. Please allow enough time to for the technicians to perform necessary tasks.